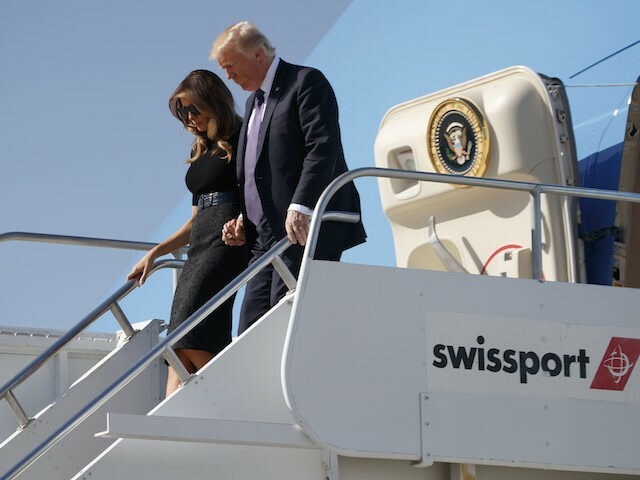 President Donald Trump and first lady Melania Trump visited Las Vegas on Wednesday after a deadly shooting killed 59 people at a country music concert and wounded hundreds more. The president and first lady met with local officials and members of law enforcement and the medical community who responded to the mass shooting at a country music festival in Las Vegas. “In the depths of horror, we will always find hope in the men and women who risk their lives for ours,” Trump said after meeting with law enforcement officials. The president delivered a somber statement, acknowledging that many families were suffering after a loved one was killed or wounded. The president recognized many members of law enforcement who gave up their lives to save others. “While everyone else was crouching, police officers were standing up as targets just trying to direct people and tell them where to go,” he said. He also recognized the heroes who tried to save family members, loved ones, and even total strangers from the gunfire. He told several stories of police officers who helped tend to the victims, including law enforcement officials who were off duty. 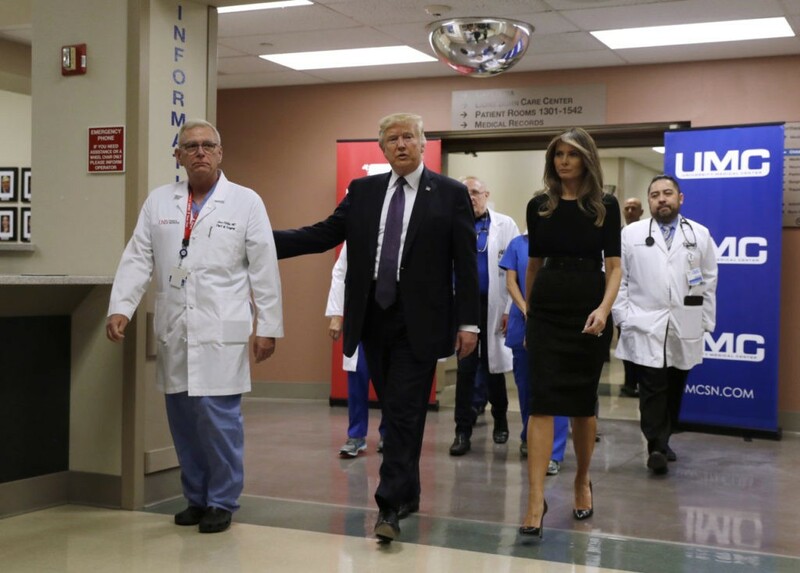 The Trumps also traveled by motorcade to the University Medical Center to visit with victims of the shooting, their families, and medical professionals helping them recover. “We met patients that were absolutely terribly wounded and the doctors, the nurses, all of the people of the hospital have done a job that’s indescribable,” Trump said. Trump spoke with reporters after visiting the hospital, praising the medical staff who moved quickly to respond to the shooting victims. He recalled stories he had heard of victims who were shot multiple times during the shooting while trying to help others, and that some of the wounded refused to leave in ambulances, to save room for people who were more seriously injured. “We couldn’t be more proud of the community response. Every hospital took serious patients. Everybody took care of them well,” he said. “I have to tell you, it makes you very proud to be an American when you see the job that they’ve done,” Trump said, congratulating the doctors and nurses at the hospital. He told reporters that he invited some of the shooting victims to visit the White House once they were healed. “I said, if you’re ever in Washington, come on over to the Oval Office,” Trump said. Trump said that details of the shooter and his motivations would be released soon. 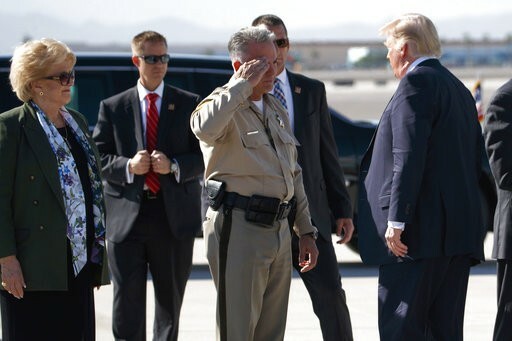 The Trumps traveled aboard Air Force One to Nevada with House Majority Leader Kevin McCarthy, as well as Nevada lawmakers Sen. Dean Heller and Rep. Mark Amodei from Washington, DC. 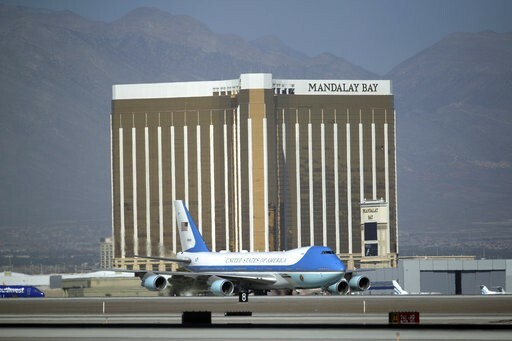 They were greeted on the runway by Las Vegas Mayor Carolyn Goodman; Nevada Gov. Brian Sandoval; and Clark County Sheriff Joseph Lombardo, who saluted the president. The president and first lady’s visit to the hospital was closed to the press. 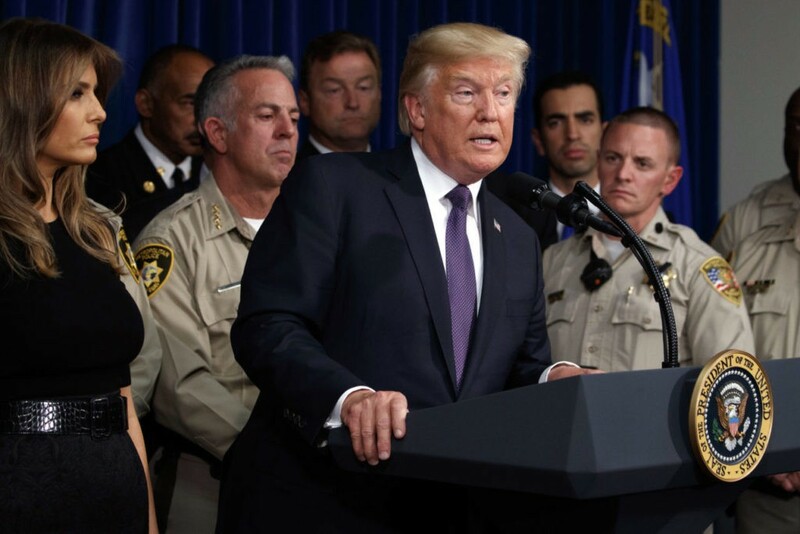 Later in the day, the president is expected to meet with first responders and law enforcement officials who responded to the horrific shooting; the president is expected to deliver remarks to the public.